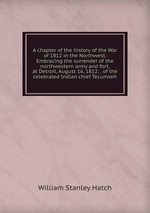 Аннотация к книге "A chapter of the history of the War of 1812 in the Northwest. Embracing the surrender of the northwestern army and fort, at Detroit, August 16, 1812; . of the celebrated Indian chief Tecumseh"